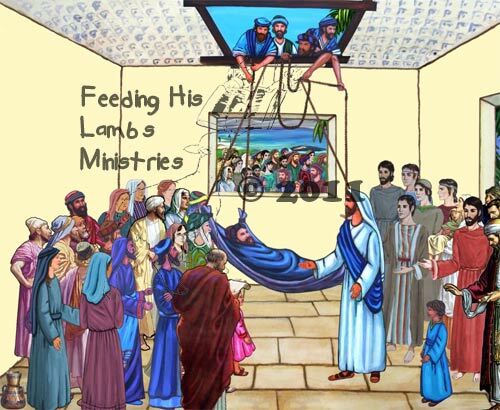 The Bible lesson the healing of the man let down through the roof. Click here for more information and to download the notes for Free. Download the notes to this Children's Bible Study. What do the lesson numbers mean? (Lesson YBQ3 39) This is lesson number thirty nine of the second year in a three year series of lessons that cover the Bible starting in Genesis and finishing in Revelation. YA = Year A or Year number 1, YB - Year B or Year number 2, YC = Year C or Year number 3. Q1, Q2, Q3, Q4 represents the particular quarter the lesson falls into, and finally the actual number of the lesson corresponds to the week of the year 1 - 52. Can I buy this lesson along with others and get a discount? Do I need Microsoft® Powerpoint® to run this Bible lesson slideshow? Can I use this on my website, videos, DVD's, or other publications? No, these slideshows, and the images in them, may only be used in live public or private presentations, NOT over the internet, in videos, websites, or other forms. 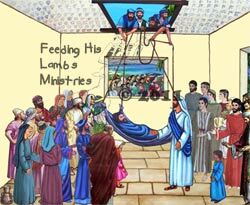 In order to obtain special usage rights for other uses and projects please contact Feeding His Lambs Ministries. Teach and coordinate a children's evangelistic series with the aid of the CD and DVD in this package. Included are: 23 Bible Messages in the MP3 audio format, 48 Reproducible Coloring Pages, Bible Transcripts, Decision Cards, Training Manual, Object Lesson Videos, Activity Helps, Program Outlines, Teacher's Planning Pack, Craft Discussion Cards, Registration Packet, and Advertising Materials. !! !NOW INCLUDES THE NEW DIGITAL FELT SLIDESHOWS!!! Click on the picture on the left to find more detailed information about the program contents. This large collection of Bible Images(more than 1500) allows the teacher to create beautiful and realistic presentations for children. Microsoft® Powerpoint® or equivalent is required to make the images move on the screen. This is a wholesome alternative to video games, TV, and other soul-destroying entertainments. These Bible graphics are easily used at home, school, or church. For teachers, this collection will save you time and money as compared to the traditional Bible felt sets.